The flux of water with unique thermohaline properties from under ice shelves influences the growth of sea ice in adjacent regions as well as affecting marine biological productivity . However, spatial variations in under-ice oceanographic parameters and basal ice topography are poorly constrained due to logistical challenges accessing these waters. 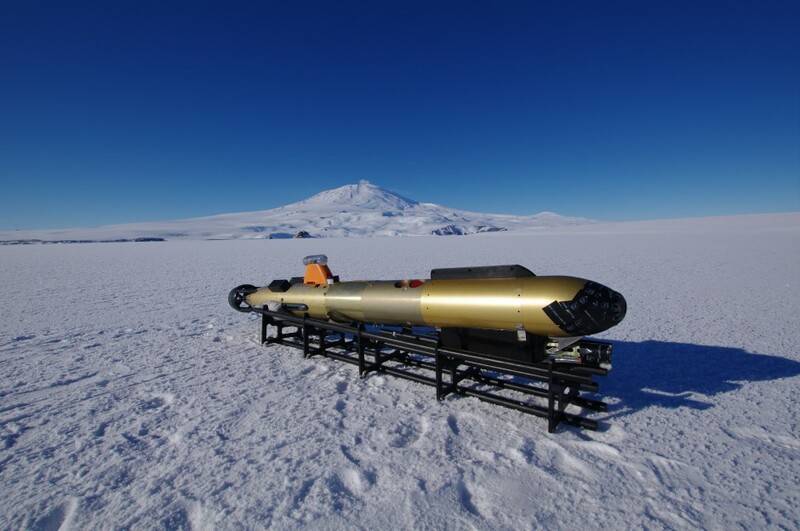 We will investigate ocean-ice coupling in the waters of McMurdo Sound by deploying a small autonomous underwater vehicle (AUV) through ice adjacent to the Erebus Glacier Tongue, an elongate ice shelf. We will: (a) map and image submarine sea ice and glacier face topography and ice thickness using upward-looking high-resolution multibeam sonar and optical camera; (b) measure the spatial distribution and temporal variability of temperature and salinity in the upper water column; (c) determine convective mixing processes and advective fluxes of sub-glacial water; (d) investigate biophysical interactions by measuring chlorophyll and other relevant parameters; and (e) model ice shelf-ocean-sea ice coupling of physical and biological processes and relate these to the climate system. The under-ice AUV survey will be co-located with an ongoing water column turbulence timeseries and a profiling oceanographic mooring , providing an important spatial context to analysis of the ocean-ice system. Recent collapse of polar ice shelves , the significant reductions in sea ice extent and the predicted 33 ± 9% reduction of sea ice area by 2100 around much of Antarctica , emphasize the urgent need to better understand and predict the response of the ocean-ice system to climate change. However, current understanding is limited by spatially discontinuous under-ice oceanographic data due to logistical challenges . The UBC-Gavia Autonomous Underwater Vehicle (AUV) research group at the University of British Columbia (UBC), led by Dr. Bernard Laval, is one of the few labs in the world able to collect spatially resolved datasets under ice. Our collaboration with the ongoing sea ice study in McMurdo Sound led by Dr. Craig Stevens, an expert in Antarctic physical oceanography at the New Zealand National Institute of Water and Atmospheric Research (NIWA), provides an opportunity to make a significant and timely contribution to determining oceanographic mechanism involved in sea ice evolution. Our involvement will provide a critical missing link: a spatially resolved, multi-layered subsurface dataset that will directly compliment the temporal measurements. We will map the under-ice surface and complete an extensive hydrographic survey of the region near the Erebus Glacier Tongue by deploying UBC-Gavia, a portable AUV (<2m length; <50kg mass) through a small ice-hole (50cmx250cm) in the landfast ice of McMurdo Sound in Oct/Nov 2010. UBC- Gavia is one of the few AUVs in the world to have been deployed under ice  and has a nominal range of 30-40 km, enabling the vehicle to complete several transects at multiple depths between charges guided by a precision inertial navigation system. The vehicle has a suite of high-resolution sensors and the collected geo-referenced data will include: photographic and multibeam sonar imaging of the ice bottom, temperature, salinity, acoustically derived current velocities, chlorophyll, CDOM and optical backscatter. A 3-dimensional multilayered analysis of ice topography, oceanographic parameters and biological data will permit a comprehensive interpretation of processes interacting at the ice shelf-ocean-sea ice system, providing a deeper understanding of physical and biological controls on the climate system in the cryosphere. The AUV under-ice survey will be co-located with under-ice turbulence measurements obtained by Dr. Timothy Stanton (Naval Postgraduate School) and Dr. Miles McPhee (University of Washington) and analyzed in context with hydrographic profiles and mooring time-series data collected as part of an ongoing study led by Dr. Craig Stevens (NIWA). Robinson, NJ., M. J. M. Williams, P. J. Barrett, and A. R. Pyne. Observations of flow and ice-ocean interaction beneath the McMurdo Ice Shelf, Antarctica. J. Geophys. Res., 115, C03025, doi:10.1029/2008JC005255. Stevens, CL; Robinson, NJ; Williams, MJM; Haskell, TG. 2009. Observations of Turbulence Beneath Sea Ice in Southern McMurdo Sound, Antarctica. Ocean Science, 5, 435-445. Mueller, D., L. Copland, A. Hamilton and D. Stern. 2008. Examining Arctic ice shelves prior to the 2008 breakup. Eos Trans. AGU 89: 500-501. [doi:10.1029/2008EO490002]. SCAR 2009. Scientific Committee on Antarctic Research (SCAR) Report: Antarctic Climate Change and the Environment. Scott Polar Research Institute, Cambridge, United Kingdom. 526pp. Forrest, A.L., B.E. Laval, M.J. Doble, E Magnusson, and R. Yeo. (2008) AUV measurements of under-ice thermal structure. Oceans 2008 IEEE/MTS. Quebec City, PQ, Canada. 10 pages. The Scientific Committee on Antarctic Research Standing Scientific Group on Physical Sciences. [www.antarctica.ac.uk/met/SCAR_ssg_ps/AGCS.htm]. Doble, M.J., P. Wadhams, A.L. Forrest, and B.E. Laval. AUV deployment through ice: two years of Arctic experience. Cold Regions Science and Technology. 56: 90-97. Nicholls, K. W. et al. Measurements beneath an Antarctic ice shelf using an autonomous underwater vehicle. Geophys. Res. Lett. 33: L08612, doi: 10.1029/02006GL025998.